Oh, I most definitely have a favorite coffee mug. I had mugs made up by the company that took school pictures of my daughter. Her picture is on the side of a very big, well-made mug and I drink from it every morning. I bought several so that if it ever breaks I’ll have others! What a clever idea. And having extras is a must. Thanks for commenting. Ooooooh, I adore coffee, but alas, coffee does not love me. Makes me physically ill if I have as much as one cup. Dang it all. Still, I sneak one in every now and then and take my chances! Sisters are very special. Thanks for coming by. I fixed the link to your blog. Don’t know how it got NASA!!! I loved hearing about your sisters weekend. Those are such important memories to make! I only drink coffee that has chocolate in it (caffe mocca, moccachino). Some may say that’s cheating but for me it’s the only way! Thanks, Patricia. My oldest son likes his with chocolate also. I just started drinking coffee literally last week, so I don’t have a favorite mug yet. I do have those really cool cups from Bed, Bath, and Beyond that keep hot drinks hot and cold drinks cold. You can microwave them and the inside gets hot, but not the outside. My mom loves them. Thank you for commenting. Every diet I read says ditch the caffeine. Not happening in this house. I will limit how much I drink but not give it up altogether. I’ll investigate BBandB – my coffee always gets cold before I’m finished. Don’t care for cold coffee. What brand are they? They’re called Tervis Tumblers. 90% of the designs are microwavable, but you can look up online which design can go in the microwave. Thanks, Angela. Will look for them. Fun blog, Linda! Tipping my cup to you. Perhaps a coffee-liker? Thanks for stopping by. My coffee cup is from Nanowrimo 2008. It’s a 14 oz. mug that says “Can’t Talk; Noveling”. No one else is allowed to use it. 🙂 As for coffee…I’ll drink it black, but I do use a splash of evaporated 2% milk on occasion. It’s got to be Starbucks or Peet’s. Haven’t ever heard of Peet’s. Thanks for stopping by. I think your coffee cup is very pretty and the fact you have such warm memories attached to it makes it very special indeed. 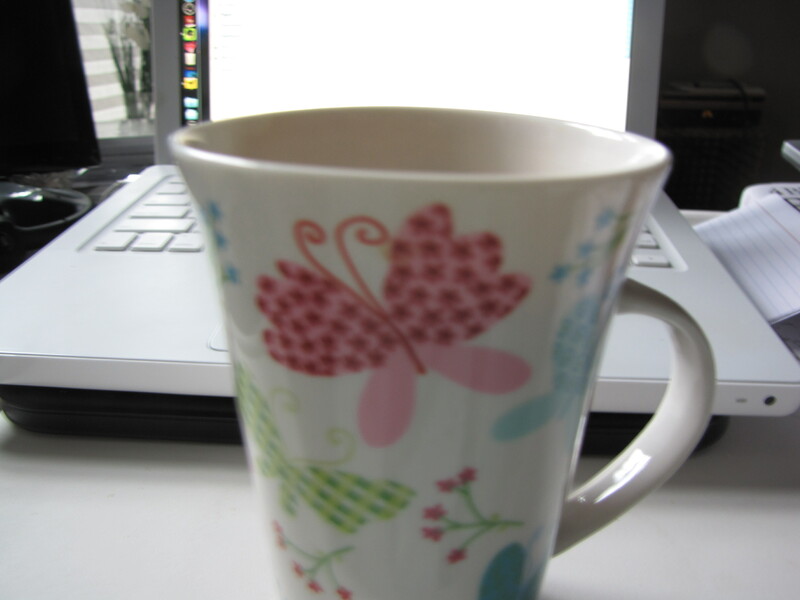 My favorite coffee cup is from an old china pattern called The Brook. It’s red and white toile-like pattern with a little scene of an English country cottage and a brook. I love any coffee from Fresh Market and Starbucks but I’m also happy with plain old Maxwell House Breakfast Blend. Your cup sounds lovely. Some of the old patterns are so beautiful. Thanks for commenting. The auto dealer had a Kureig. After using it, I decided that wasn’t the way to go for me. Thanks for commenting. I love your cup! Butterflies and flowers always remind me of spring and make me smile. The odd thing is I hate coffee, but I do have a favorite coffee cup. It’s really large and has Tinker Bell on it. I fill it with milk in the summer and hot cocoa in the winter. When I write at home it’s what i’m drinking out of. When I look at it I get lost in my memory of Disneyland, which I call my happy place. What a great post. I learned a lot about what is special for you. What a great story. I have another cup for my hot chocolate. It’s twice as tall. My granddaughter loves Tinker Bell and I have to admit a special fondness for her. I don’t have a particular favorite mug although yours is gorgeous and I love how it always reminds you of your sister. My two favorite coffees are 1) my own blend of fine, medium roast with a dash of cinnamon and 2) if out and about, I do love a butter pecan latte. YUM! Love the dash of cinnamon. Butter pecan latte does sound yummy. Thanks for coming by. I have a favorite mug with a sister story as well. It’s such a beautiful reminder of the bond we share and the precious times we have together. My favorite coffee: vanilla hazelnut latte. Dessert, I know! Sisters are very special. Thanks for coming by.